Conceptually we consider fired glazes as being composed of 'oxides'. Materials supply those oxides to the melt. The ten major oxides likely make up 99% of all base glazes (and materials we use). The oxide formula of a glaze "explains" many details about the way the glaze fires. Thus we can view materials as simply suppliers of the oxides needed to get the desired fired result. Well, actually, it is not quite so simple. While frits have a wide range of chemistries and melt nicely to yield their oxides to the melt, it is not the same story with many raw materials. Some of them do not melt nearly so well. Wollastonite, for example, is not quite as ready to dissolve in the melt as calcium carbonate. Some materials melt poorly by themselves but are active in the presence of others. Some materials are extremely refractory and very difficult to dissolve into the melt (e.g. calcined alumina). Knowledge of material specific melting is needed to rationalize how to apply chemistry, especially when recipes being compared draw on different sets of materials to source the chemistry. An analysis (or percentage analysis) is typically used to express the oxide content of materials. 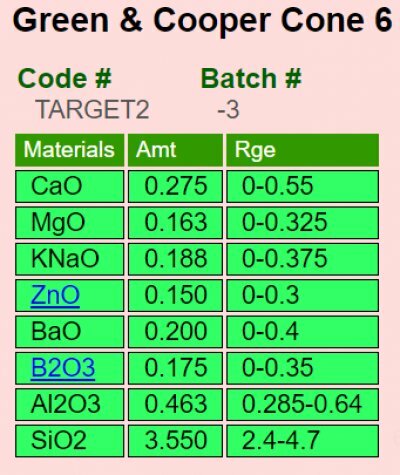 An analysis is expressed in percent and each number represents the amount by weight of the oxide (in the raw material, not the fired material). Thus, as appropriate, an analysis will often show LOI (loss on ignition) as one of the items, this represents the volatile portion of the material that is lost during firing. Sometimes the volatiles are specified (e.g. H2O, CO, CO2, SO2). An analysis can be converted to a formula by dividing each oxide amount by the molecular weight of that oxide. The formula can optionally be unified after that. An "analysis" compares oxides by the weights of their molecules (not the numbers of molecules as does a formula or mole% formula). Thus an analysis comparison of the oxides in a material can look quite different from a mole% comparison, this is because oxide molecule weights differ greatly. The analysis format is best suited to showing how much of each individual oxide is in a mix. For example, feldspars are used as a source of flux, although they also provide SiO2 and Al2O3. A percentage analysis enables a buyer to compare how much flux each brand has. As noted, material analyses include organics, water, and additives which are burned away during firing. For example, if a material loses 10% by weight on firing, we can just say the LOI (Loss on Ignition) is 10%. Or we could say it loses 5% H2O and 5% SO2 (10% LOI can only be expressed in a formula by increasing its formula weight, but this is not obvious to the reader unless they know what the formula weight would be if there was no LOI). As noted, the formula is ideal to express the mix of oxides in a fired ceramic where there is no LOI. 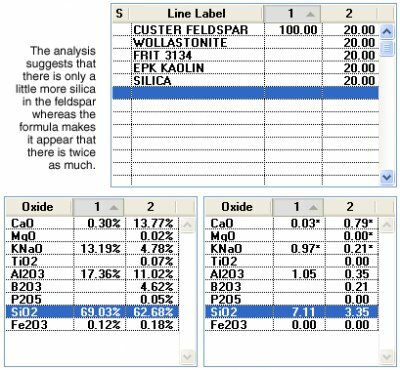 But the analysis has become a standard used to express the make-up of raw clay materials on manufacturers data sheets. 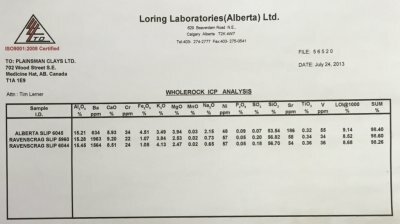 If you wanted to express the makeup of a premixed raw glaze powder, it would be appropriate to do so as an analysis also (unless it had no LOI). Desktop Insight was the first to enable users to compare two recipes and their formulas side-by-side and interactively update when recipe changes were made. It also enabled users to show formulas and analyses side-by-side. The ppm items are not oxides, they are elements. Ba for example, is shown as 4276 ppm. We do not know the form. It could be barium sulphate, barium carbonate, barium nitrate, barium chloride. But altogether they supply this amount of Ba. The same is true of chrome, strontium, nickel and vanadium. A limit or target glaze formula. What does this mean? Recipes show us the materials in a glaze but formulas list oxide molecules and their comparative quantities. Oxides construct the fired glass. The kiln de-constructs ceramic materials to get the oxides, discards the carbon, sulfur, etc. and builds the glass from the rest. 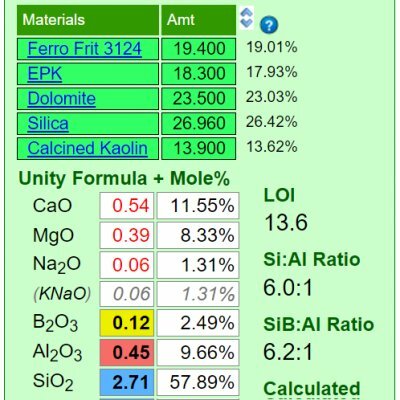 You can view glazes as recipes-of-materials or as formulas-of-oxides. Why use formulas? Because there is a direct relationship between the properties a fired glaze has (e.g. melting range, gloss, thermal expansion, hardness, durability, color response, etc) and the oxides it contains (links between firing and recipe are much less direct). There are 8-10 oxides to know about (vs. hundreds of materials). From the formula viewpoint materials are sources-of-oxides. While there are other factors besides pure chemistry that determine how a glaze fires, none is as important. Insight-live automatically shows you the formulas of your recipes and enables comparing them side-by-side. Click the "Target Formula" link (on this post at digitalfire.com) to see what each oxide does. (Videos) Substituting Materials by Weight: Why it does not work!